From UGA SID: William C. Hartman Jr. Fund contributors can begin ordering University of Georgia post season football tickets today. William C. Hartman Jr. Fund contributors were mailed a football post season ticket application on Monday, October 29th. This application provides William C. Hartman Jr. Fund contributors the opportunity to reserve both SEC Championship and Bowl Game tickets until the priority deadline of 5:00 pm Friday, November 16th. The letter will include ticket prices as well as a patron number and PIN/email information. Orders will be accepted by mail, but orders placed over the internet will require the patron number and PIN/email information. All games in which Georgia may be selected to play will be listed. William C. Hartman Jr. Fund contributors should request only the venues in which they are willing to travel. The Athletic Association will not charge your card until the SEC Championship and bowl bid has been officially determined. Orders will be filled only for the game(s) in which Georgia is selected to play and tickets will be assigned based on William C. Hartman Jr. Fund cumulative score. Any orders received after the priority deadline will be filled on a first-come, first-served basis regardless of priority. 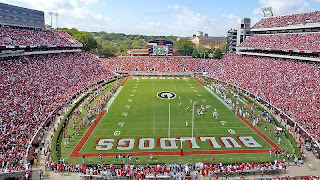 In the event that the demand for tickets for a particular game exceeds Georgia's supply, it would be necessary to reduce and/or cancel orders. For more information, log onto georgiadogs.com and click the link for tickets or call the Ticket Office at 1-877-542-1231. Only Visa and MasterCard credit cards will be accepted. PWD NOTE: this has nothing to do with my stubhub stuff. This is all official UGA stuff. well, the may may very well wear the traditional home jerseys but still... why are they going to all this trouble wanting the fans ALL in black when they will not be? hmmm.... doesn't make sense. Plus, they showed up at the Tuesday press conference in black along with Richt. Again, they are going to great lengths to request this from the fans, they wear black at the press conference, and then the big event of the week, they wear red? Sounds fishy to me! Richt has not totally denied they would not wear black-just said they couldn't get them done in a week. Could have been in the plans a few weks ago.